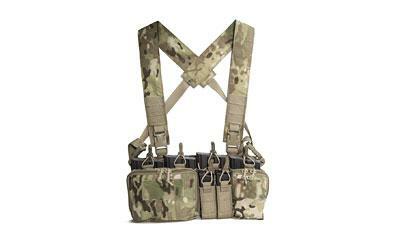 The Haley Strategic Disruptive Environments Heavy Chest Rig (D3CR) is similar to the original D3CR but was designed for .308 weapon systems in mind. The D3 Chest Rig platform is designed for work in urban, vehicle, rural and other settings where a modular chest rig is needed. It can be worn as a stand alone chest rig with a detachable H-harness or clipped into a plate carrier that is equipped with a quick release system. When the Chest Rig is low profile enough to be worn as a fully loaded stand alone system and not print with a normal or loose fitting jacket or sweatshirt. When used with a plate carrier and a quick release system it can be attached or detached quickly. The harness can be removed and the chest rig can be attached via Velcro to a plate carrier as well. The Chest Rig comes with 4 rifle magazine pouches with retention staps which can accept almost any .308 magazine. It also is equipment with 2 Multi-Mission Pouches which are designed to accept any double stack or single stack pistol magazines. The elastic pouches have rare earth magnets in them so they will conform and hold any metal magazines you place in them. The Multi-Mission Pouches are also good for holding flash lights, knives, multi-tools or other equipment. There is also a "Stuff It" Pouch for other equipment and two General Purpose pouches.